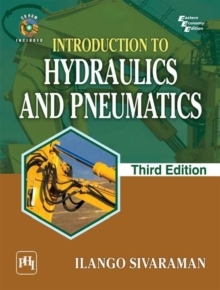 This introductory textbook designed for undergraduate courses in Hydraulics and Pneumatics/Fluid Power/Oil Hydraulics offered to Mechanical, Production, Industrial and Mechatronics students of Engineering disciplines, now in its third edition, introduces Hydraulic Proportional Valves and replaces some circuit designs with more clear drawings for better grasping. Besides focusing on the fundamentals, the book is a basic, practical guide that reflects field practices in design, operation and maintenance of fluid power systems-making it a useful reference for practising engineers specializing in the area of fluid power technology. It provides simple and logical explanation of programmable logic controllers used in hydraulic and pneumatic circuits. The accompanying CD-ROM acquaints readers with the engineering specifications of several pumps and valves being manufactured by the industry. Key Features:Gives step-by-step methods of designing hydraulic and pneumatic circuits. Explains applications of hydraulic circuits in the machine tool industry. Elaborates on practical problems in a chapter on troubleshooting.